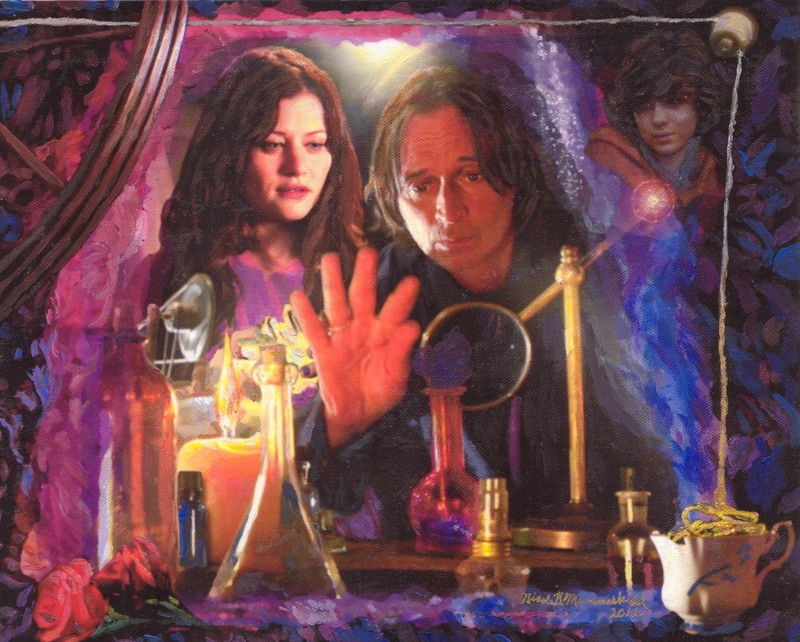 This is a scan of an acrylic and ink multimedia art piece that I made for an upcoming charity auction, Dec. 8th-15th, being put on by Pamela Anneliese Parker’s Facebook group “Once Upon A Time… Fan Community” to raise funds for With Kids, a children’s charity for which Robert Carlyle is ambassador. Details to follow. *I do not own the rights to these characters. Author’s Note: This is written with great respect, love and gratitude for the talents of Robert Carlyle, Emilie de Ravin, all the cast of Once Upon A Time, all the writers of OUAT, but especially, Jane Espenson, who wrote my two favorite OUAT episodes “Desperate Souls” and “Skin Deep”. The inspiration of the aforementioned talents marks the end of my approximately fifteen year drought in writing fiction. Thank you all! To my readers, though this is heavily inspired by season one, it will not always be ‘canon’, and since this story has been in the making during the hiatus, it will not be a carbon copy of events from the upcoming season two. I have a particular ending goal for my story, hence season two stories that work with that goal might be included, while stories that are detrimental to that goal will not. In my opinion, Belle is the ultimate ‘Butterfly Effect’ to Rumpelstiltskin and his plans, adding chaos, but also love to his life. I do not own these characters. It is my intent to illuminate the heart of these characters with supreme respect for the talents that created them. So, enjoy the ride. The very long day started as a routine day for patient number 682303. As routine as it could be for someone secretly locked in a mental ward for almost twenty-nine years, as part of Evil Queen Regina’s power play. Patient number 682303 had finished her dinner. She was sick, bored and regretting her hasty decision from the previous day. She felt an unnamed emptiness in her spirit, as she had for nearly twenty-nine years. She used the handle of the spoon and left over beet juice to doodle on a napkin. Once finished, she tucked it in her sleeve, hoping it wouldn’t be taken from her. It always seemed like things were being taken from her. Laying on her cot, the door opened, and everything changed. An orderly named, Jefferson, entered her room told her to find Mr. Gold, whoever that was, and tell him that Regina had locked her up. Wearing hospital clothing and a tweed coat ‘borrowed’ from the unconscious head nurse in the mental ward of Storybrooke Hospital, 682303 was escorted by Jefferson out of the hospital and directed to Mr. Gold’s shop. The shop appeared closed, but the door was unlocked, thus she ventured to the back room, where a man in a dark suit was standing with his back to her. 682303 asked, “Are you Mr. Gold?” The man with a Scottish brogue started to speak before facing her. He seemed intent upon giving her the bum’s rush out the door, until he saw her face. 682303′s day became more strange, as the man gawked at her as though she were a ghost. She managed to do as instructed by Jefferson, asking for protection from Regina. To her confusion and shock, the man, with the flowing dark hair and dark eyes, looked at her with unabashed love and hugged her in a manner that was unlike any embrace that she could remember. They left the store, got into his black Cadillac car, drove to a wooded area and walked into the forest and up the mountain. 682303 was very unsure as to what they were doing, but she obediently followed. As they approached a peak, a wave of light flowed through the forest. With that flow of light, everything that she knew changed. The emptiness that she had felt had a name, Rumpelstiltskin It was him! It had to be. He looked different since her time at the castle, but it was definitely him, and her name was Belle. Their last words at the castle were words of hurt and anger, after Belle made the biggest mistake of her life, taking the advice of a seemingly kind stranger, Regina. Yet Rumpelstiltskin had embraced her with such love at the shop, perhaps he had forgiven her transgression. Belle’s love for Rumpelstiltskin seemed to be trying to burst out of her every pore. She declared her love for him, and to her delight and astonishment he reciprocated with a declaration of love. Belle’s dreams were finally coming true. Then Rumpelstiltskin said, “There’ll be time for that later. There’ll be time for everything. But first there’s something I must do.” He poured True Love’s Potion into the old wishing well. Purple mist appeared, and as was typical in life with Rumpelstiltskin, uncertainty reigned supreme. Belle sprays the conditioner into her hair and begins using the comb to work through the tangles. “Well, there was the harsh looking blond nurse with her hair curled high on her head, the male doctor, who always seemed to have his gown, mask and cap on, a male orderly with sandy blond hair and green eyes, and some type of medical assistant, he had dark wavy hair and green eyes…he seemed really troubled to be involved. I don’t think he knew who I was, but I overheard arguments between him and the nurse, he was concerned that they weren’t following…”, Belle pauses to remember the words he used, the continues, “…’proper medical protocols’ with me. So that’s four people…plus, Jefferson.” “How long did he know about you being there?”, Rumpelstiltskin asks. “I really don’t know. I hadn’t seen him before today.”, she explains. Belle takes a break from combing, laying the comb back down. There is an extended silence. Feeling the need to do something, Rumpelstiltskin picks up the comb and gets ready to comb Belle’s hair. She looks at him with a confused smile. “Is this alright with you?” he asks. “Yes, I suppose.” She repositions herself in the bed to have her back to him, and Rumpelstiltskin commences working his fingers and the comb through a difficult tangle. Belle, momentarily turns her head toward him and says, “Thank you. It feels nice having somebody else do it.”, then turns back. Rumpelstiltskin smiles and focuses on the task at a hand. Keeping busy helps him to clear his mind. “Did you really think, I thought I was better than you?”, he asks. Bowing her head, “I’m sorry I said that.” “You didn’t answer the question.”, he says. Belle turns to face him, “Rumpelstiltskin, I’m not completely ignorant of what was going on with you. You walked around that castle like a gaping wound. I know people must have hurt you…acted like they were better than you.” Belle breaks eye contact, bites her bottom lip and sighs, then looks back into Rumpelstiltskin’s questioning eyes, “Even though I understood that, it still hurt when you did it to me.” He says, “Belle, I was only having a bit of fun with you. I really wasn’t trying to make you feel like you were less than me.” Unconvinced, Belle asks, “Can you honestly say that fun was always your only motivation?” He pauses, then responds, “No, there were moments I wanted you at a distance. You were just getting too close for me to handle.” “I think I knew that, to some extent. I just wanted to help somehow, but I didn’t know what to do with the feelings I was having. I liked your playful, mischievous side, but not knowing where I stood with you, made it painful at times too. I’d never had those kinds of feelings…I never cared where I stood with Gaston…although at least a room length away was preferable”, Belle smirks. “With you, having the feelings that I was having, was like being thrown in an ocean and not having the foggiest idea of how to swim.” Rumpelstiltskin smiles, as a small ironic chuckle erupts, “There were times I felt like I was drowning too.”, lightly moving a strand of hair from in front of her forehead, “Perhaps, we both should have taken swimming lessons.”, he quips. Belle giggles, “That might have helped.” Staring into each other’s eyes for an extended time, then feeling a bit unsure what to do or say next, Rumpelstiltskin breaks eye contact, begins combing Belle’s hair from the front. Without looking at her face, Rumpelstiltskin asks, “Belle, why are you so sick?” “I think that’s partly my fault. The other day there was a commotion in the ward. I heard through my door that all the pills were knocked on to the floor. Well, when they got it all straightened out, they forgot to give me mine. I hated those pills. They gave me different kinds over the years, and I always got sick in some way. So, when they came around with my pills the next day, I faked swallowing them. For some strange reason, I thought there might be an opportunity to get out, and I wanted a clear head. Well, the clear head didn’t happen, but I’m out.” Then the question that he didn’t want to ask escapes Rumpelstiltskin’s lips, “So it was always the nurse who helped you get cleaned up, right?” There is an extended silence, and a look of shame shrouds Belle, “I said it was humiliating.”, she says in a hushed tone. Rumpelstiltskin’s stomach clenches again, trying to focus on combing her hair, he asks, “Did anyone there do anything to you?” Belle hesitates, just for a moment and says, “At a hospital, they do a lot of things to you, but if you’re asking what I think you’re asking, no, nobody at the hospital did that to me. It was just embarrassing and painful things. Can we talk about something else, please?” “Yes, of course, but just one thing. Do you want me to try to heal you?”, he asks. “No, I don’t think I want that right now. There’s too much going on with my body right now. I don’t want to add magic to it. If it gets too bad, maybe, but not right now.”, responds Belle. Rumpelstiltskin questions again, “Are you sure? I could make you feel more comfortable.” Belle snaps, “Rumpelstiltskin, no, please don’t push me.” “As you wish.” he says in a dejected tone. Rumpelstiltskin places the comb on the night stand, slips his right hand into his jacket pocket and gets up. “Rumpelstiltskin?”, Belle hooks her pinkie around the pinkie of his left hand and looks up at him with large sincere eyes. “I’m sorry that I’m not pleasant to be around right now.” He smiles with a soulful sweetness in his eyes, “It’s fine, Belle, I understand that you’ve been through a lot. It’ll take a while to adjust. Perhaps you should eat soon.” “Wait. If I hadn’t stumbled into your shop today, what would you be doing right now?”, Belle asks. Furrowing his brow in confusion, he asks, “What are you getting at dear?” Belle looking at him with understanding eyes, “You have plans. It may have been a long time since we’ve seen each other, but I know your ‘I’m working on something’ look. That pulsing spot right above your eye brow is a give away. Stop fussing over me, and do what you planned on doing. I’ll try to rest for a while. We’ll have plenty of time to catch up later.” Then with a maternal tone, Belle instructs, “Off you go.” Rumpelstiltskin smiles, somewhat astonished by her concern for his plans. “Well, as you wish dear.” Belle lays back on the pillow, “Rumpelstiltskin?” He responds, “Yes, love?” A large smile breaks across Belle’s face at hearing him call her ‘love’. “Leave the door open please. I’d rather not be behind closed doors.” “Of course.”, he nods and turns toward the doorway. “I love you, Rumpelstiltskin”, she calls out. Turning back to her, “Oh, Belle, I love you too. Now, get some rest, and I’ll peak in when I’m done.” “That’ll be wonderful.”, a sleepy eyed, Belle croons. The cold bath having eased the pain enough, that she can relax a bit, Belle snuggles the collar of Rumpelstiltskin’s robe against her face and breathes in his scent. The scent is of being home, closing her eyes, she focuses her thoughts on Rumpelstiltskin. Unlocking his study, Rumpelstiltskin enters and walks to a small oak wall cabinet with brass handles. Opening the cabinet, he retrieves five potion bottles. Two of them had been prepared early that morning, in anticipation of magic returning and the plans they would help him fulfill. The other three bottles are empty. Emma want to help her…and to know more. In her car, she looks at a crystalline plastic horse necklace, hanging from the volume knob of the stereo, and thinks of its former owner, Marissa. Emma had shared a ‘room’ (cell) with Marissa, during her time in lock up, during her third trimester with Henry. Belle’s eyes had the same haunting quality as Marissa’s. Emma becomes lost in thought about Marissa. Marissa was a year younger than Emma. She had long flaming red hair, freckles and eyes that stayed with a person long after they stopped looking at her. Unlike Emma, she had a family life, friends and had excelled in school. She was the kind of girl that it would have been easy for Emma to hate, if Marissa weren’t so kind hearted. Marissa was never the type to cut class, until the day came when seeing a performance was too much for her to resist. Unlike others her age, who would have ditched class to get to Phoenix to see a rock concert, Marissa’s temptation was a one time performance of “La bohème”. She never made it to the opera, as she was busted for truancy. While this minor offense usually yielded a lecture from a judge and some public service hours, Marissa had the great misfortune of having Judge Hardwick Miller. Judge Miller and the owner of a nearby correctional facility had a cozy arrangement. Miller supplied occupants for the facility, the owner of the facility would get substantial payments from the state, then Miller would get a cut of the money. Eventually, both Miller and the correctional facility’s owner, would get cells of their own, but it was much too late for Marissa. Marissa’s sentence was one year in the correctional facility. Marissa, though terrified, was relieved to meet her room mate, Emma Swan. Marissa, the oldest of five children, had seen her mother through the last couple of pregnancies, and decided as long as she had to be there, she might as well help Emma, as much as she could. At meal times, anything that Marissa thought might be good for the baby, managed to travel from Marissa’s plate to Emma’s. After lights out, Marissa and Emma would talk, and Marissa, who had a pristine soprano voice, would softly sing songs, when she knew Emma was upset. Occasionally, Marissa would make her way to Emma’s cot and sing silly made up songs to the baby. Marissa’s paternal grandmother, who was from Poland, was known for many Yiddish words, and Marissa had a habit of using such words in everyday conversation. Marissa would often tell Emma that she would be fine having the baby, because Emma had “chutzpah”. Marissa had managed to bring into the facility a crystalline plastic horse necklace, which she gave to Emma, telling her that she could ride anywhere on a crystal horse. For the first time in Emma’s life, she had someone looking after her. That was the case for the first month of Marissa’s incarceration. Then came the day that the facility owner’s son, Brian X. Phillips III, got a job in the facility. It never should have happened that a man would have access to a women’s facility. It was one of many examples that Emma would see of people with too much power, abusing said power. Early on, Emma noticed him eyeing Marissa. She tried to stick close to Marissa, as much as possible, but then one day, Emma was ordered to the warden’s office to discuss plans for Emma’s unborn baby. After the meeting, Emma looked for Marissa with no luck. By meal time with no sign of Marissa, Emma was in a full scale panic, particularly after noticing the Brian, was grinning like the cat that ate the canary. She had checked everywhere that inmates were allowed to go, then she thought of the linen closet. There was Marissa, looking disheveled, with bruises on her wrists and a shattered look in her eyes. The next day at dinner, a scuffle broke out between two well known trouble makers, and in the course of events, a search for ‘contraband’ was conducted, and Marissa was found ‘holding’ something in her sweater pocket. Though she declared her innocence, Marissa was told she would have three days of solitary confinement. When Emma, sensing a frame up, tried to intervene, Marissa begged Emma to stop, because she didn’t want the baby to be harmed. Marissa, reasoned with Emma, that three days alone wouldn’t be too bad. Emma prayed that Marissa would be alone. When Emma saw Marissa again, she had a large bruise on her neck, more bruises on her wrists and arms, and was drugged into a stupor. When Emma questioned the guard about Marissa’s state, Emma was told that Marissa was a very disturbed girl, who needed to be medicated for her own safety and the safety of others.